Dorchester IUPAT DC 35 Painter’s Union has worked to refurbish St. Mary’s Center for Women and Children, adding a fresh appearance to the Jones Hill facility. IUPAT DC 35 is a local chapter of the International Union of Painters and Allied Trades that has over 600 members living in Boston. In addition to protecting the best wages and interests of its members, District 35 frequently participates in charitable projects that foster community. 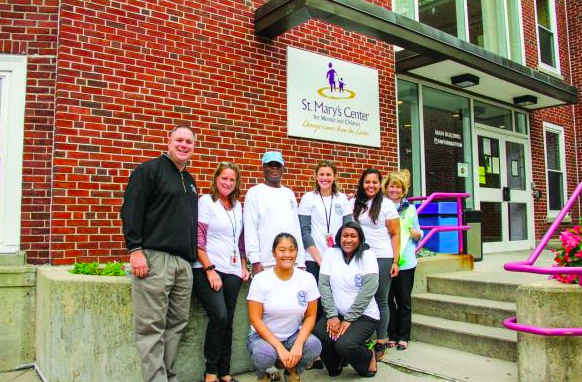 IUPAT DC 35 began its involvement with St. Mary’s over four years ago, seeking to support an organization that provides valuable resources to women and children living in Dorchester who have experienced extreme poverty and homelessness. When St. Mary’s was in need of spiffing up to meet the city’s inspection standards, members of IUPAT DC 35 who were between jobs would come in and work for a small fraction of their usual pay in order to repaint everything from bedrooms to stairwells.